One of the first things that a consulting psychologist will do with a team is to help the group establish a climate of freedom. Decades ago when I was a brand new psychologist working at a 5,000 person Honeywell manufacturing plant in Phoenix, I witnessed this dramatic effect. From simply removing blocks to freedom of thought and action for the team members, the group catapulted from last place in the company (the shameful position of the 27th performing team) to the 1st place team, in only a few months. As an internal consultant, this made me hugely popular. To those who didn’t know much about psychology, it was like a magic trick. But of course it had almost nothing to do with me. One piece of luck was a leader who was extremely bright, open, and achievement-oriented. He was minimally encumbered by ego so we didn’t have to spend time on that. In team-building having this type of leader is like stacking the deck. I applied the principles of psychology that I’d been taught and the natural forces took over. Participation, motivation, and creativity all increased. The team revved like an airplane that had been finally cleared for takeoff. Then, productivity flew. In The Constitution of Liberty, F.A.Hayek explains that freedom is “that condition of men in which coercion of some by others is reduced as much as possible in society.” He reminds us that freedom is not power, wealth, or even happiness. In fact, freedom might mean the absence of these. And it is not entitlement. Steve Jobs, the premier inventor of our time, could never have created what he did without the freedoms provided in our country. Jobs had the freedom to go to college and the freedom to drop out. He had the freedom to reject his father. He had the freedom to start a company in a garage. He had the freedom to get kicked out of his own company and he had the freedom to start all over again. He even had the freedom not to listen to his customers–he didn’t survey them. He felt they didn’t know what they needed. This November we honor our veterans on the historic date of 11-11-11. We think about their service and their sacrifice. 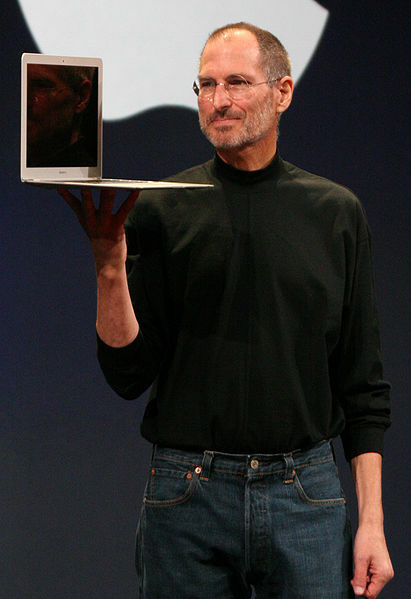 Steve Jobs possessed a naturally creative temperament. But what made it possible for him to reach his potential, to light the entire world with his inventions, was that time and chance placed him in this country, a country where Lady Liberty has made her home.